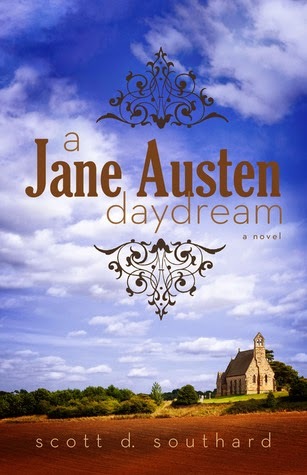 Today we are spotlighting Scott Southard's novel A Jane Austen Daydream. As huge Jane Austen fans, this book is a perfect fit for I'd So Rather Be Reading! Keep reading for more information about A Jane Austen Daydream. Scott D. Southard, the author of A Jane Austen Daydream, swears he is not obsessed with Jane Austen. He is also the author of the novels: My Problem with Doors, Megan, Permanent Spring Showers, Maximilian Standforth and the Case of the Dangerous Dare, and 3 Days in Rome. With his eclectic writing he has found his way into radio, being the creator of the radio comedy series The Dante Experience. The production was honored with the Golden Headset Award for Best MultiCast Audio and the Silver Ogle Award for Best Fantasy Audio Production. Scott received his Master’s in writing from the University of Southern California. Scott can be found on the internet via his writing blog “The Musings & Artful Blunders of Scott D. Southard” (http://sdsouthard.com) where he writes on far-ranging topics like writing, art, books, TV, writing, parenting, life, movies, and writing. He even shares original fiction on the site. Currently, Scott resides in Michigan with his very understanding wife, his two patient children, and a very opinionated dog named Bronte. One of the best books I've read in a long time. Highly recommended to anyone who enjoys Jane Austen novels (or the TV and movie adaptations). One of the best books I've read in a long time. Highly recommended to anyone who enjoys Jane Austen novels .